Announcing my new direct print book from my journey. Also the first in-depth look at Death Valley photos. I am so happy with the quality of the printing and shipping from Blurb direct print. I am very happy with my paper upgrade although it added significant cost, it allows the colors of my photos to show through amazingly vibrant with great detail. If you would like to order just click the link above to see the preview and order. I will be going in-depth on some of the images, their titles, and traveling tips when going to these places. Also if you would like to purchase prints, I have a new format I think you will like. My ordering site cannot handle panoramic formats as of yet but I decided I wanted people to be able to mat the images without losing part of the image anyway so I made a border with the title and my name and year taken. So if you would like to buy prints from the book and some not in it, just click the link to go to the gallery and click on the image and then on the shopping cart. 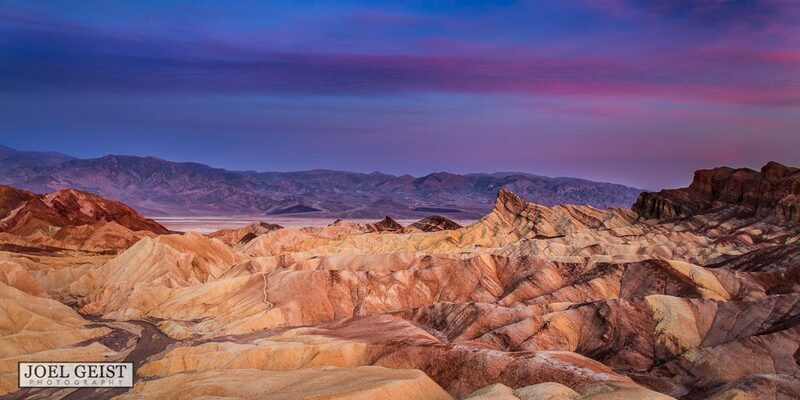 In the first in Depth Look We will be taking a look at the cover photo and Death Valley National Park. 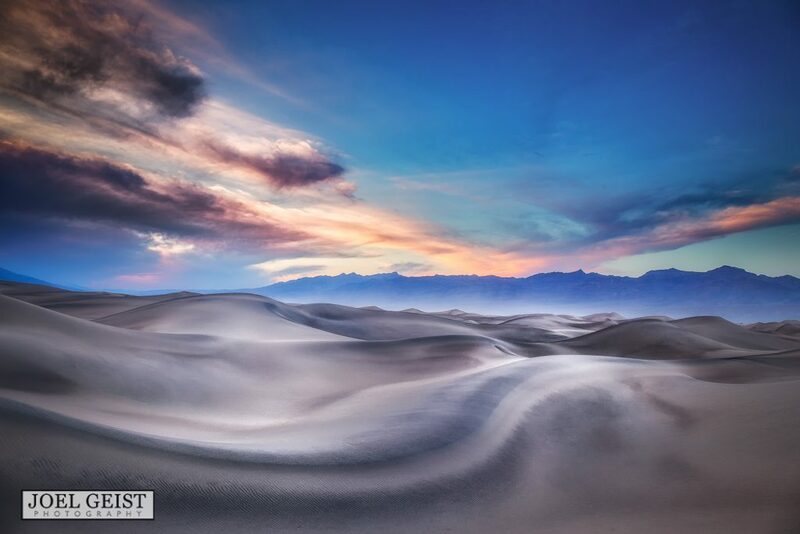 The image is titled “Waves of Change” as the dunes of Death Valley National Park are always changing. The clouds kind of cooperated but giving a muted contrast; I originally had intended for this image to be black and white but when processing I thought I color would give it the feeling of the welcome cooler temps with the cool blue color temperature in contrast the heat of the desert. The hard-line on the S curve of the dunes is what I saw from across the dune field. I actually had passed it and was off to the back right when I saw it. I walked back over my footsteps so my tracks would not be in the shot. In the dunes this often adds significant distances to my hike but that is how I did things before the digital age and that is how I continue to because it saves time and if feel better knowing I don’t have to spend an hour fixing footprints to make them natural. Footprints in the dunes can be fixed in Photoshop but I am photography purist and like to start with the cleanest image possible and I also do not do sky, sun, or moon placements it may add some sand trudging but its worth not losing some of the great textures that lay in the sand. There was a ton of smog in the air from L.A. like a dark colorless haze, muting all colors, leaving only scorching heat and no visual interest in the skies which persisted for two days. I hiked the dunes in search of just using the lines in the dunes since the weather was not helping me much. “Barren Allure” was a golden hour photo, this happened to be evening. Golden hour is the hour before sunset or after sunrise in which the sun is not overhead but at an angle which gives it the warmer light from the sun being more filtered from the atmosphere and longer shadows. 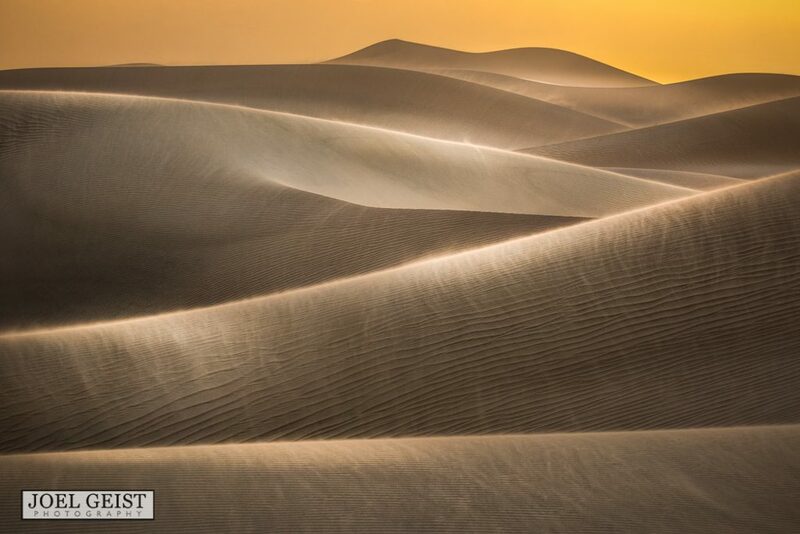 This is the beauty of Death Valley as a landscape photographer, even without clouds and a windy day you can capture photos that can be simple and yet the sand and textures can produce great photographs without much help. Zabriskie Point is an amazing feature of the park and sunrise can lift your spirit, seeing the golden rock faces glow in the soft morning light. Then the shadows become harsh and then the blistering heat right after it. This image did not make my cut into the book but I wanted to show some variety to the park. I could spend all of my time at Death Valley in the dunes but there is so much to see elsewhere and in certain times of the year it transforms into a different place. There are many other places to explore in the valley such as Badwater, but it was only a mud pit this time of year, Devils Golf course which is an amazing feature of salt deposits and the Painters Palette which is full of color and a great drive through but I need to explore that area more for a great spot next time. There is one place I have wanted to go but I did not have the funds to get there which is the wondrous Racetrack, it requires a high clearance 4×4 or a guide and since I am driving my HHR it still eludes me. I missed the super bloom this year but I would rather battle the heat than throngs of people who are attracted to the bloom. Beware of summer heat it is called Death Valley for a reason. These were taken in early May and temps were right around 100 each day. The desert will dry you out quickly, I take a gallon of water when I go out two hours before sunset. I headed out planning on being out for about three hours. Temperatures were above 100 and I was carrying about 25 pounds of gear plus my water and set out into the dunes. Dehydration can sneak up on you quick and walking the dunes is very grueling. The beating sun and its rays reflected off the sand cause you to sweat more than you realize because the dry air evaporates it almost immediately. Being here twice before I am familiar with dangers of heat exhaustion but my trusty Barmah hat gives plenty of shade and I wear a long sleeve Heatgear shirt designed for hot weather and it is perfect for hiking in high temps it wicks away moisture and evaporates it quickly which cools you to a certain extent, and it also keeps the sun off of your skin. If you have any questions about anything on travel here or any photos feel free to ask in the comments section below.